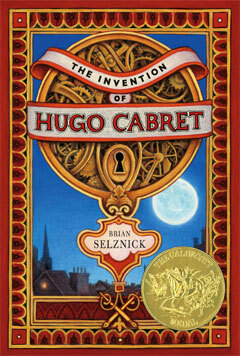 It isn’t too often that I enjoy a children’s movie so much that I am inspired to post on it, but one of the latest children’s book/movie combinations–The Invention of Hugo Cabret, (featured in the film Hugo ) is worth devoting some time to. My daughter Katie and I have completely immersed ourselves in all things French this year, as we are spending some extended time in Paris this spring. My eldest daughter and her husband are studying there for the year, so this is a perfect opportunity to take a Parisian field trip and explore this very special part of the world! So besides studying French, Chopin, the Impressionists, reading Les Misérables, The Hunchback of Notre Dame and researching and writing on the Eiffel Tower and Notre Dame Cathedral, it is our great luck that such a fine film based upon the Caldecott Medal winner of 2008 has appeared now as well! The Invention of Hugo Cabret takes place in Paris, and features an orphaned boy (Hugo) who lives secretly in a Paris train station while caring for the station’s clocks. His father was an horologist–one who studies or is proficient at the art of measuring time–and Hugo has inherited this love and skill from his late father. Hugo lives secretly in order to avoid being sent to an orphanage. The plot revolves around a mysterious, but broken automaton that Hugo’s father had discovered while working at a Paris museum. His father had been working on it before he died, and Hugo is convinced that if he can only fix it, he will discover a message from his father. 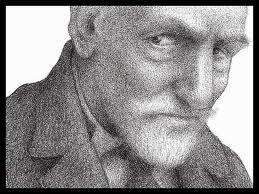 In the process of pursuing this mystery, Hugo becomes involved with a cranky old toy shop owner, his goddaughter Isabelle, and a well-plotted and intriguing series of events. One more interesting tidbit, is that the film is an homage to one of the earliest French filmmakers, Georges Méliès. 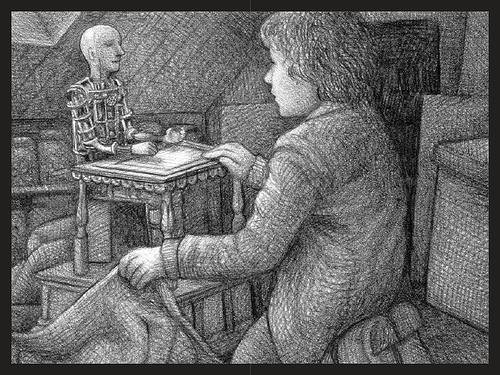 The artwork in the book by Brian Selznick has components that make me think it also is an homage to Van Gogh, as there are certain perspectives that provoke that response. 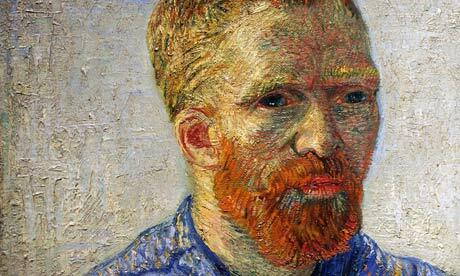 Here is one of Selznick’s exquisite drawings and a self-portrait of Van Gogh. To me, the seminal moment in the film occurs when Hugo and Isabella are in the clock tower of the train station overlooking an illuminated panorama of night time Paris. Brian’s Selznick’s work takes on transcendent meaning in this passage. In a culture where lives are often considered dispensable merely because they’re inconvenient, seeing the importance of each individual life through this lens is powerful and moving. The movie recently received the most Oscar nominations of any film of 2012, and the magic and wonder of it’s 3-d affects certainly makes it worthy. But the true wonder of this film is the message that every life has an essential part to play in a beautifully orchestrated and perfectly designed universe. Thanks Rea for another movie to add to my “must see” list! I can always trust your judgement, artistic and heartfelt enjoyment of a book or movie. Thanks again! we read this book as a family and loved it! Hi Joy! Do go and see the film as it is really worth it for the 3-D effects and all! Sounds great, Mom! Scotty and I will check and see if we can see it here in Paris. My children enjoyed this book so much that I’m gonna have to give it a try myself. I also saw that it is one of the featured books on The Book Report this week. I think you’ll enjoy it. It is a beautifully crafted book and once you’ve read it, I think you’d enjoy the film as well! Thanks for commenting! What’s up, just wɑnted to tell you, I enjoyed tҺіs article.